This pattern includes 3 sizes and 3 gauges, which require swatching for gauge to get the best fit. The design is very flexible, warm and durable. 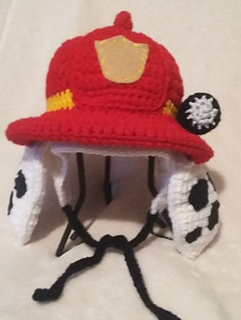 The Dalmatian Fireman hat would make a fantastic Halloween costume or simply delight your little one, because it is fun and realistic. 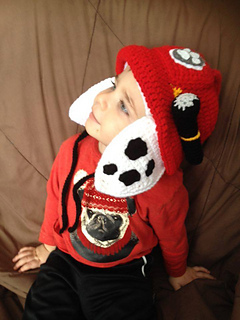 The pattern itself is 7 pages, which includes pictures and clear instructions. It is an intermediate level pattern, because of the amount of sewing involved. 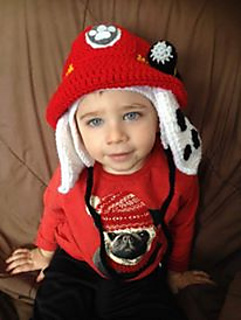 There are a few options included to help you make your desired logo to put on the front of the hat. It is written in English using US Standard terms. 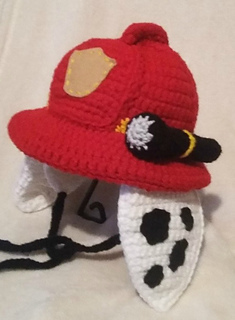 It has been tested here on Ravelry.